The market for neurorehabilitation devices holds a lot of potential, analysts have found. Already well-established markets in North America and Europe, coupled with immense growth opportunities in the emerging economies of Asia Pacific and Latin America indicate the favorable pace at which the global neurorehabilitation devices market is likely to grow over the coming years. The introduction of wearable technology and robotics has been having a tremendous impact on the development of neurorehabilitation devices and this push by researchers and device manufacturers alike is exactly what the global market needs. The emergence of several new therapies over the past few years and the potential presented by additional investigational treatments are anticipated to drive the value of the neurorehabilitation devices market from US$894.9 mn in 2015 to US$3.2 bn by 2024 at a 15.5% CAGR therein. 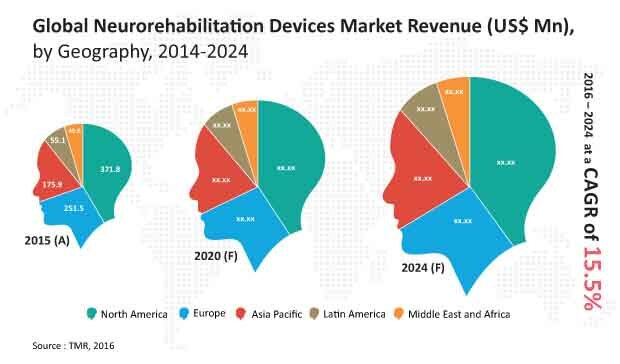 The global market for neurorehabilitation devices comprises five main regional segments: North America, Asia Pacific, Europe, Latin America, and the Middle East and Africa. The alarming rise in the incidence of stroke has driven the North America neurorehabilitation devices market to account for a 42% share in 2015. The Centers for Disease Control and Prevention states that almost 130,000 Americans die from stroke each year, with an average of one America dying from stroke every 4 minutes. This wide-spread prevalence of stroke, resulting in various neurological disorders, is forecast to boost the demand for neurorehabilitation devices in North America from 2016 to 2024. Neurological disorders are also brought on with age and as a result, countries with a large geriatric population base are likely to be the potential markets for neurorehabilitation devices. This is one of the key factors driving the market in Europe, especially in countries such as Spain, Germany, France, the U.K., and Italy. Asia accounts for an estimated two-third of the world’s disabled population and the number is projected to rise in the next decade. This can be attributed to not just the growing incidence of stroke in the region but to the alarmingly high road traffic fatality rates. Asia is home to highest percentage of traumatic brain injury resulting from road traffic accidents, unintentional injuries, and falls. These patients demand the availability of neurorehabilitation devices, thereby rendering the Asia Pacific region a massively lucrative market for global as well as regional players, registering a 17.0% CAGR from 2016 to 2024. Neurorehabilitation devices include brain computer interfaces, neurorobotic systems, wearable devices, and non-invasive brain stimulators. Neurorobotic systems held the largest share in the neurorehabilitation devices market in 2015 and is likely to continue its dominance in the market over the course of the forecast period. Non-invasive brain stimulators, on the other hand, are projected to witness the highest growth rate from 2016 to 2024. The major applications of neurorehabilitation devices include traumatic brain injury, Parkinson’s disease, stroke, spinal cord injury, and cerebral palsy. The demand for neurorehabilitation devices for Parkinson’s disease is estimated to register the fastest growth rate during forecast period owing to the rising incidence of Parkinson’s in developed countries such as the U.K., the U.S., Iceland, Finland, and Ireland. This report on the global neurorehabilitation devices market analyzes the current and future prospects of the market. The report comprises an elaborate executive summary, including a market snapshot that provides overall information of various segments. This section also provides the overall information and data analysis of the global neurorehabilitation devices market with respect to the leading market segments based on type of device, application, and geography. The research is a combination of primary and secondary research. Primary research formed the bulk of our research efforts, with information collected from telephonic interviews and interactions via e-mails. Secondary research involved study of company websites, annual reports, press releases, stock analysis presentations, and various international and national databases. The report provides market size in terms of US$ Mn for each segment for the period from 2014 to 2024 considering the macro and microenvironmental factors. Growth rates for each segment within the global neurorehabilitation devices market have been determined after a thorough analysis of past trends, demographics, future trends, technological developments, and regulatory requirements. The market overview section of the report includes qualitative analysis of the neurorehabilitation devices market, including the factors determining the market dynamics such as drivers, restraints, and opportunities along with Porter’s Five Forces Analysis, emerging trends, and various therapies for neurorehabilitation. In addition, various analyses such as market attractiveness analysis by geography and competitive landscape by key players have been provided. The market attractiveness analysis explains the intensity of competition in the market in different regions. The competitive scenario between market players is evaluated through market share analysis. These factors would help market players to take strategic decisions in order to strengthen their positions and expand their share in the global market. The global neurorehabilitation devices market has been segmented based on product, application, and geography. Based on product type, the neurorehabilitation devices market has been categorized into neurorobotic systems, brain computer interfaces, non-invasive brain stimulators, and wearable devices. Based on application, the global rehabilitation devices market has been segmented into stroke, traumatic brain injury, spinal cord injury, Parkinson’s disease, cerebral palsy, and others. Market revenue in terms of US$ Mn for the period from 2014 to 2024 along with the compound annual growth rate (CAGR %) from 2016 to 2024 are provided for all the segments, considering 2015 as the base year. Geographically, the neurorehabilitation devices market has been categorized into five regions: North America, Europe, Asia Pacific, Latin America, and Middle East & Africa. The report also provides market size and forecast for select countries in the respective regions such as the U.S., Canada, the U.K., Germany, France, India, China, Japan, Brazil, Mexico, South Africa, and Saudi Arabia. The recommendations section included in the report would assist existing players to expand their market shares and new companies to establish their presence in the neurorehabilitation devices market. The report also profiles major players in the neurorehabilitation devices market based on various attributes such as company overview, financial overview, business strategies, product portfolio, and recent developments. Major players profiled in this report include Medtronic plc, St. Jude Medical, Inc., Hocoma AG, AlterG, Inc., Bioness, Inc., and Ekso Bionics Holding, Inc.